Alloyneering is a generic term, developed at the Laboratory of Materials at University of Thessaly. It combines the words Alloy and Engineering and describes a concise knowledge-based methodology leading to the design and development of engineered alloys. Alloyneering encompasses the application of computational alloy thermodynamics and kinetics on one hand, which can describe the microstructure evolution, with suitable strength models on the other hand, which link strength with microstructure, for the design of metallic alloys with tailored properties. The flow chart of Alloyneering is shown below. 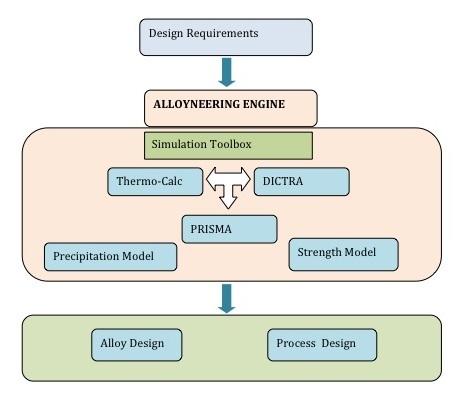 The aim of Alloyneering is ALLOY DESIGN and PROCESS DESIGN. People contributing to this site are graduate and doctoral students as well as researchers of the Laboratory of Materials at UTH. In addition to the above, anyone working in microstructural simulations, alloy design and ICME in general, is welcomed to contribute to the site with a simulation example or an alloy design example (see CONTRIBUTORS in the main menu). This will help to disseminate information in the ICME community.